Quinn and I decided that we wanted to celebrate the spring with a little BBQ party and our house. 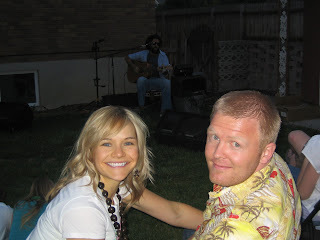 Leave it to Quinn to book Kalai to play a backyard concert for our humble BBQ. Since Quinn stepped it up with the entertainment, I felt it necessary to step it up with the food. After a few of our infamous planning sessions, our small BBQ turned into a PARTY! We sent out formal invites, cooked 25 pounds of pork for sandwiches, and topped it off with a chocolate fountain! We had a great time and hope to make it an annual event. What were the Millet's up to in May?? I apologize that I have dropped off the blogging planet the last month. The Millet's have been quite busy and it has left me little time to report on our life's activities! 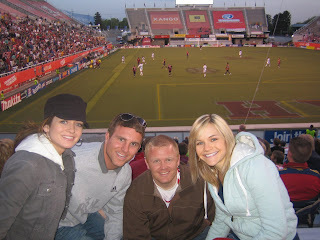 In the early part of May our good friend Bryan Hurd invited us and few other friends (including newly married Tyler and Rachel Buzzwell) to a Real Salt Lake Game. Everyone knows that the probability of actually catching one of the shirts that is blasted out of those high powered guns is very low. Well, it must have been Quinn's lucky day. (This is not the "actual" catch, but a very convincing re-enactment. We recieved some interesting looks from the crowd when Quinn got this excited twice!) Quinn almost fell down the bleachers to catch the shirt, but hey at least HE caught it.